Peter Nolan in front of WSU Tri-Cities Student Union Building. RICHLAND, Wash. – Peter Nolan spent four years after high school serving in the military police through the U.S. Army. But as his enlisted contract came to a close, he decided to leave active duty to pursue college full-time. He knew an education would provide him with the background and know-how to not only succeed in a future job, but also provide him with greater career advancement options. 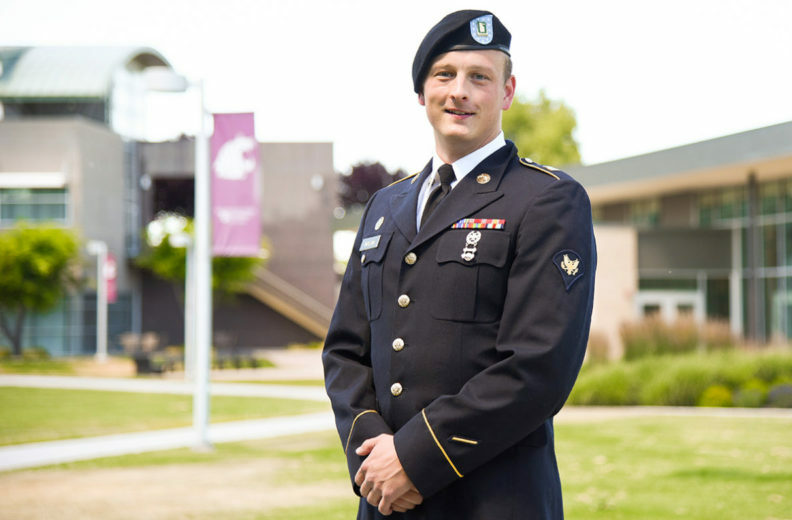 Finding and attending Washington State University Tri‑Cities, he said, has allowed him to continue pursuing a rewarding military career part-time through the National Guard while studying at a top research university on a small campus. “I wanted to go to a good school, but also in a small, tight-knit community, because that is truly the type of school environment where I thrive,” he said. Nolan joined the U.S. Army in 2011. From there, he served two years in Germany, in addition to being stationed at Fort Drum in upstate New York for an additional two years. During his service with the U.S. Army military police, he had opportunities to serve as a patrolling officer, investigate traffic accidents, provide ceremonial support for the military community, as well as serve as personal security for high-ranking individuals. After his contract ended, he attended a community college in western Washington, planning to specialize in nursing. A few semesters later, he felt that career route wasn’t for him. Relying on his experience in law enforcement in the armed services, he realized he had a passion for that area of public service. Upon examining options for state schools in Washington and doing a couple of ride‑a‑longs with civilian officers, he decided to transfer to pursue a degree in social sciences from WSU Tri‑Cities. Nolan said the small campus and class sizes were attractive because it would allow him to better connect with professors and become really invested in his classes. Plus, his degree in social sciences would provide him with the knowledge and skills suited for law enforcement. Social sciences, he said, offers an emphasis in sociology, English and psychology, and provides an understanding of how to work with people. Nolan plans to continue his military service. Currently, he works part time with the Washington Army National Guard, providing critical training to new recruits while still taking classes full-time. After graduation, he plans to either pursue a career in civilian law enforcement or continue a career with the National Guard. The military, he said, provides him with the discipline and work enthusiasm to perform optimally with his tasks at hand. Prior to his life in the military, he said he struggled in school. But the military provided him with a healthy appreciation for work ethic and self-identification of goals.